The style is also available in kit and printed booklet. A short and fun chunky yarn project! Linen stitch makes up the main body of the bag while bobbles are used on the flap along with tassels for extra detailing. 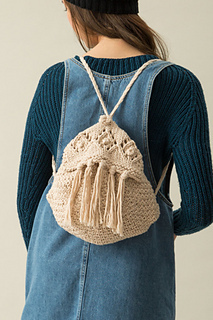 The main body of the rucksack is worked in the round in linen stitch. 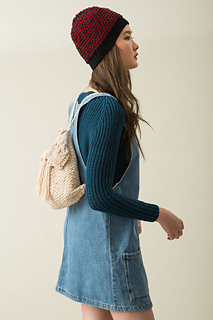 The flap is knitted separately, featuring bobble stitch detailing and tassels. Assembly involves attaching the flap to the main body and weaving, then attaching the plaited straps. It is an English (UK) written pattern, including a measurement diagram. This style is designed in collaboration with Emma Wright.